High quality fabrics are essential for the perfect window decoration. All Silent Gliss fabrics are extensively tested on various systems for perfect hanging for both blinds and curtains. The Collection from Silent Gliss captivates with its variety of qualities. Besides transparent, dimout and blackout fabrics, Silent Gliss offers an exquisite diversity of materials, colours and special technical characteristics. The Collection concentrates on special fabric technical features we know that window shading is about more than just decoration. The Silent Gliss Collection sets itself apart from other collections on the market by putting the focal point on the physical fabric characteristics. Thereby fulfilling not only the need for design but also for functionality. Silent Gliss offers a wide range of high quality screen fabrics with various transparencies and a maximum width of 3 meters for optimum shading. Achieving optimum light levels, especially at workstations, is a crucial success factor for productivity. The challenge as always is to maximise natural daylight whilst avoiding glare. Silent Gliss have included a range of fabrics in the Collection which aim to manage glare whilst maintaining daylight and retaining an outside view. Managing glare is also important when it comes to protecting furniture and pictures since aggressive UV rays destroy pigments and surfaces. Maximum outside view with lowest transparency. Various transparency classes within the same fabric quality for a consistent look on different building facades. This means stronger shading for South facing windows and more light comes through on North facing windows and all with the same looking fabric. This measure (sometimes shown as a percentage in the name of the fabric) indicates the area of openings (holes) relative to the overall area. The openness factor is inde- pendent of colour and should not be confused with light transmission. Screens and fabrics with a white or aluminumcoated reverse reflect the sunlight and reduce heat transmission which means that less energy is needed to cool the room or building. Specifically developed technical textiles with white or metallic backing reflect the sunlight and avoid direct heat penetration into a room. This helps save energy used to artificially cool the building. Silent Gliss fabrics achieve another effect during the winter. 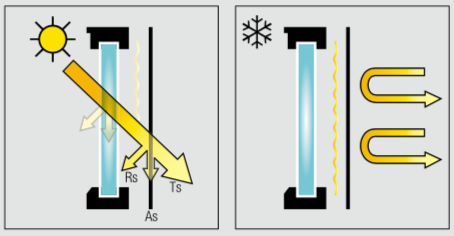 It is widely acknowledged that up to 50% of heat energy escapes through windows. The insulation properties of the Silent Gliss fabrics can contribute towards reducing heat loss and costs. If selected properly, textile window hangings prevent a room heating up too much in summer. In combination with the appropriate systems, Silent Gliss fabrics also contribute to saving energy costs in winter. Curtains, roller blinds or other systems on windows can prevent cold from creeping in and keep the warmth of the heating inside the room. While fire-retardant products and textiles are mandatory in commercial properties, the specification is seldom an issue in private houses. This is despite the fact that for most people there is nothing more precious than family and home. Silent Gliss is aware of this, which is why all Silent Gliss fabrics are fire-retardant. This link below takes you to a Silent Gliss video which simulates a fire in a children room. 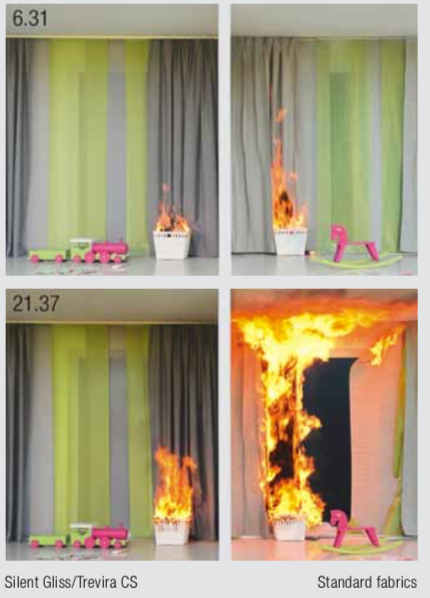 It clearly illustrates and compares the burning behaviour of non-FR fabrics with that of Silent Gliss flame retardant fabrics. How comfortable we feel in a room is closely related to the room’s acoustics. Rooms with poor acoustics give the space an uneasy feel and seem cold. 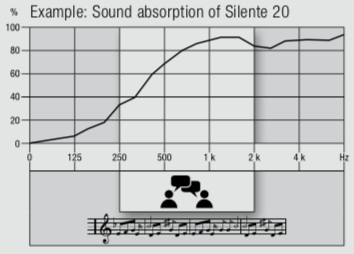 Noise levels rise as soon as several people start talking in the room, which makes comprehension difficult. The productivity and concentration of the people in the room suffer as a result. Silent Gliss has a broad range of systems and fabrics to improve a room’s acoustic quality. Our hearing is particularly sensitive in a frequency range between 250 Hz and 2,000 Hz, which is equivalent to that of human speech. The acoustically effective Silent Gliss curtain textiles focus on this range, making them particu- larly effective. Acoustically effective fabrics have the reputation of being particularly thick and heavy. This is certainly not the case with the latest generation of Silent Gliss acoustic fabrics. Not only do they have a high acoustic value, they are also very transparent and delicate. Quality of life in the rooms we inhabit is only possible if the air is healthy. Freshtexfabrics turn home and working environments into better places: Better because unpleasant smells quickly disappear. Better because contaminants are removed from the air. Better because people simply feel more comfortable in rooms furnished with Freshtexfabrics. Living conditions are more comfortable and work performance at the office improves. Silent Gliss Freshtexfabrics act as a catalyst. The air circulation in a room brings the odours and contaminants into contact with the patented Freshtex coating. This coating is based on natural mineral salts and breaks down the undesirable substances in the air into harmless molecules such as water, oxygen and carbon dioxide. 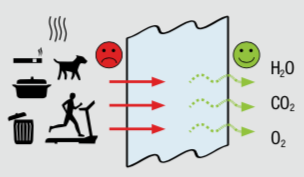 Antibacterial fabrics are an important piece of the puzzle when it comes to protecting people against the transmission of dangerous germs and diseases. This is particularly important in healthcare and nursing, since pathogenic bacteria are especially common in medical practices, hospitals and other care facilities. The precise places where people with weakened immune systems are likely to be found. Antibacterial fabrics from Silent Gliss help protect patients and clients against infection. As well as antibacterial fabrics, Silent Gliss offers fungicidal fabrics, which prevent the growth of moulds. This is particularly important in damp and warm rooms (e.g. bathrooms, double-skin facade). of processes are applied to give Silent Gliss fabrics their fungicidal or antibacterial function. They are identified in the Silent Gliss fabric collection by the icons shown below, which must be considered when selecting a suitable fabric. •A silver-based coating is applied to these antibacterial fabrics. This fulfilsthe ASTM E 2149-01 standard. •These antibacterial fabrics have silver ions fixed in their yarn. This maximisestheir wash-resistance. The effect is verified according to the JISL 1902 standard. •These fabrics are verified according to ASTM G21-09 and have a fungicidal effect. Sustainability means giving ecological, social and economic factors equal consideration when making decisions. 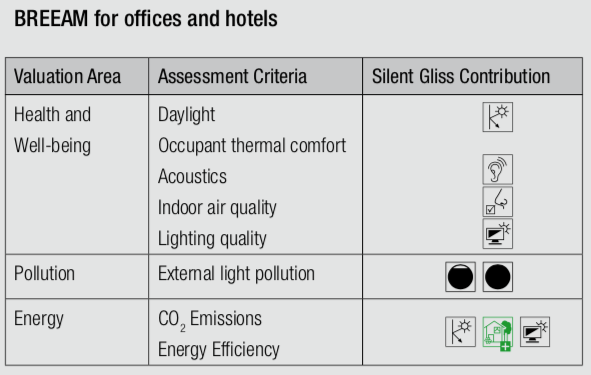 Silent Gliss has the products and offers the advisory competence to put truly sustainable solutions into practice. For example, fabrics made from recycled PET bottles which help save energy in addition to optimising the incidence of light. 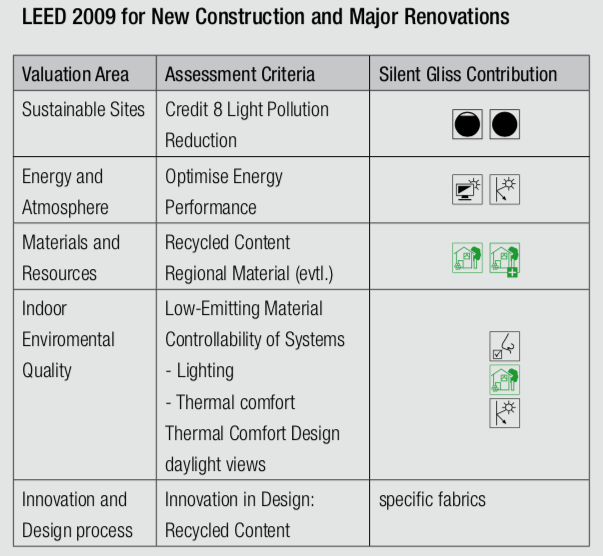 Using the example of LEED and BREEAM, the tables opposite show which areas Silent Gliss systems and/or fabrics contribute to the goals of system certification. If support for other systems such as DGNB (DE) or Minergie (CH) are required, please contact Silent Gliss. For the ultimate in customisation, Silent Gliss offer a professional digital print and laser cutting service. There really is no limit to your creativity or imagination. A souvenir photo from a recent holiday, a nature theme or a company logo or product, any of these images can be produced professionally printed on a blind. Or alternatively consider your own pattern or laser cut design incorporated into a fabric. If you can’t find the exact colour of fabric you need then Silent Gliss can print any Pantone colour onto a fabric − total individuality!